This link-detached property comes with views of the salt water flamingo lake. It is situated in a peaceful are of the popular town of Fuente de Piedra. It is almost new and contains 3 (2 double-1 single)bedrooms, walk in wardrobe or another bedroom, a lounge/diner, 2 bathrooms, W/C, an fully furnished kitchen, a roof terrace and community swimming pool. This traditional rustic property is situated close to the centre of the popular village of Fuente de Piedra. It has a private patio at the rear which is part undercover and another smaller area at the side which could be knocked into one. It contains 3 bedrooms, a lounge, bathroom, kitchen. It is habitable and just needs some modernizing in places. This property is situated at the entrance to the popular village of Fuente de Piedra and would be an ideal large family home or to start a B&B style business with 5 or more spacious bedrooms, a large lounge, reception area, 2 bathrooms, kitchen all with high ceilings and terrace. The property would need reforms undertaken on it. This property is situated close to the centre of the popular village of Fuente de Piedra. It would be an ideal family home. It has 2 large private patios at the rear where a pool could be installed. It has a very spacious feel about it. It contains 4 or more bedrooms, a large lounge, reception area, bathroom, kitchen all with high ceilings. 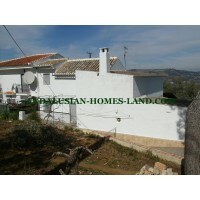 This is a nice property offering panoramic views of the surrounding countryside. It is in the village of Iznajar, a beautiful town near the lake. This property is at the end of the rocks Pine Street, at the top of the village with wonderful views of the lake. It has 6 bedrooms, 2 bathrooms, kitchen, courtyard and 2 terraces. This house has on the ground floor .Living room, kitchen, launtry room, 5 bedrooms , 2 bathrooms and terrace. Outside there is a beautiful internal patio whith 550m2. Mains water, electricity. Situated approximately 15 minutes from Antequera and 40 minutes of Malaga and the airport.